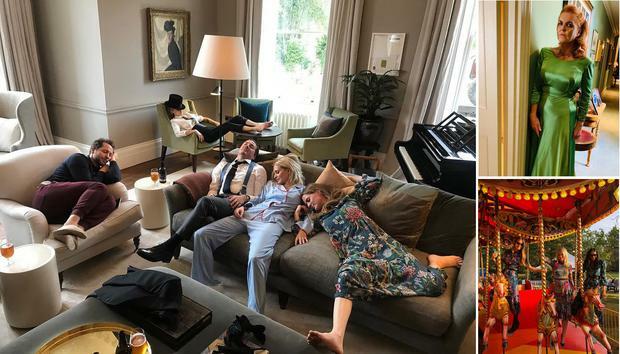 Not only did the Duke and Duchess of Sussex apparently announce their pregnancy to family members (a big faux pas, according to many) and did Ayda Field Williams raise an eyebrow or two with her 'off-white' wedding rigout, but guests also seem to have broken the couple's request for an 'unplugged' affair by snapping away during the big day. Celebrity guests such as Liv Tyler, Cara Delevigne and her big sister Poppy weren't letting the day go by without a few pics from their perspective, while Naomi Campbell even managed to get in a quick selfie from the pews of St George's Chapel. Demi Moore even went as far as to set up an Instagram account to share snaps of her Stella McCartney getup, in which she thanked the designer for kitting her out for the occasion. Prince Harry's ex and close friend of the bride Cressida Bonas was also keen to show off her outfit at the afters, posting a video of her shimmying away in a pair of glitter trousers by Micheal Kors. Mother of the bride Fergie could probably be forgiven for sharing her behind-the-scenes snaps of the big day - particularly after a certain announcement threatened to pull the attention away from the happy couple before any official snaps were even released of the second day 'funfair-themed' celebration she was reportedly very hands on with organising. The bride herself has remained silent on social media, despite being one of the few royal family members with a personal Instagram account. Gainsbourg designer Sam Dougal has even spoken to Harper's Bizarre about the bride's 'day two dress' - which reportedly saw Eugenie donning a short wrap dress and a cute pink silk jacket personalised with 'Mrs Brooksbank' in glitter on the back. "I couldn't resist stealing this sweet moment of these beauties in the powder room" Liv Tyler captioned a beautiful black and white photo of Kate Moss, Naomi Campbell, Lila Moss and Demi Moore, tagging #royalwedding in the photo. Other guests were keen to share some photos of the day after celebrations, where they collected prizes from the various funfair games in Windsor Park. Ayda and Robbie Williams were well kitted out for the day after event, with Robbie in a colourful, glittery jacket. We can only hope he wore appears in a photo with the bride in her matching Grease style get up. Although her account remains silent, Princess Eugenie reportedly gained over 50K Instagram followers over the course of the wedding celebrations.